This printable complaint letter attempts to address a billing error in an invoice or account. I would like to draw your attention to a billing error that I discovered in my account. I hope to address it quickly and would like your help in the matter. When going over my account, I discovered that on November 15 I was charged twice for the $25 MegaCool Megaphone from your company. My accounts say that I either paid for it twice or else I purchased two of the same item. Please be assured that I only need one MegaCool Megaphone. Therefore, I believe this is a billing error on your end. 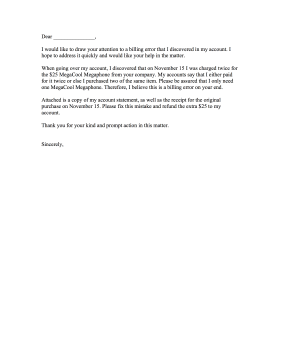 Attached is a copy of my account statement, as well as the receipt for the original purchase on November 15. Please fix this mistake and refund the extra $25 to my account. Thank you for your kind and prompt action in this matter.